While the majority of people tend to holiday during the more expensive season of July and August, the savvy traveller is more likely to be found lounging by the pool of a luxury villa during the autumn or spring. But why? Well, this is because single couples can take advantage of low occupancy discounts out of high season – meaning that the luxurious villas that would normally be out of their price range during the peak months are now tantalisingly affordable! During the months of April, May, June, September and October, discounts will be applied to the normal price of a villa for the entirety of your stay. For many people, this means that the type of villa that would usually be completely unachievable is now easily within their price range. Think glorious azure infinity pools, sumptuous poolside sun loungers and extensive outdoor space and facilities. A single couple would normally be given access to the master bedroom of such a villa together with use of all remaining areas of the property including pool, gardens, bbq and social spaces. So in essence, you are experiencing everything that a large, expensive villa has to offer but at an extremely affordable rate. Our villas in Crete are all fully licensed properties meaning that they have to conform to a certain standard and undergo regular inspections by the Greek authorities. Because of this, our customers can be certain that their holiday will not be ruined by unexpected discoveries or complications which sadly, can sometimes be the case when renting a villa that is not fully licensed. Because of this commitment to quality, we are delighted to say that over 40% of our bookings are from repeat clients. With half term approaching in October and what is likely to be a rainy few months in the UK, why not holiday like a king this autumn and treat yourself to a fabulous holiday in Crete? 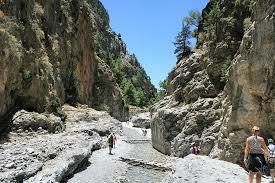 Wonderful sights such as the Samaria Gorge are at their very best at this time of year, with minimal crowds and extremely pleasant walking temperatures. Take a look at more information on Crete here. Take a look through our beautiful villas and if you have any questions, just pick up the phone and call our friendly experts on 0330 111 0061. We have extensive knowledge about the beautiful Island of Crete and keep in regular contact with all of our villa owners. When you book with Crete Escapes you are in the safest of hands and we hope that you enjoy your time in Crete as much as we do.